I'm wondering if anyone has come across this yet. I think it's a new issue with GMail. 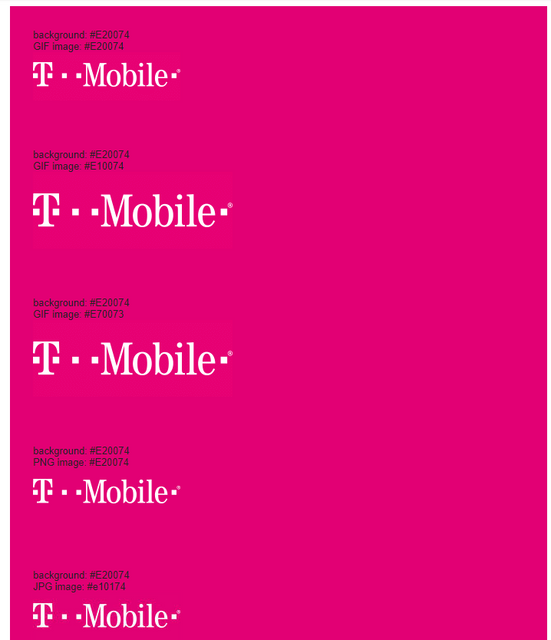 We have a brand color of #e20074 for TMobile. When the gif is opened in Gmail the color in the cached image is shifted to #e70073. This is really bad for branding. I can fix this logo by saving it as a PNG but we often have animated gifs that bleed into the magenta in other cell and they won't match now. If you have to use a GIF and you know the background colour will be the same as the logo, how about using a transparent GIF? that would only solve for logo over color. We also have animated gifs where the backgroundcolor must match in the cell below it. Thing is this never happened until recently so Gmail must have changed the compression settings on their image caching.